Whether you own a gym or you’re building your own workout space at home, the best adjustable dumbbells will make all the difference in your exercise routine. To help you find the best adjustable dumbbells, we researched a variety of new and bestselling products. The result is the top ten adjustable dumbbells review below. These top rated adjustable dumbbells are great for beginners and the pro athlete. Now: Before we get started, here’s what you need to know as you shop. Weights: Some of our favorite selections come in a pair – two weights with multiple adjustment options, so you get a total-body workout. Others come in even larger groups, offering you more diversity and range of movement. Check for the number of pieces here! 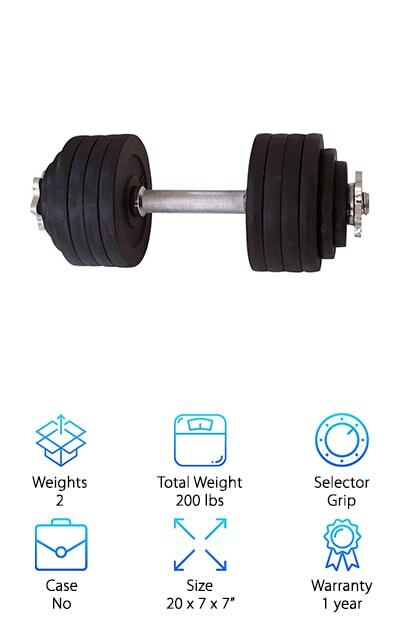 Total Weight: No adjustable dumbell review would be complete without notation of the total weight you can pull. Are you looking for a lighter set for in-home exercise? Are you stocking a gym with the latest and greatest? We’ll take care of you! Selector: How do you want to spend your time changing the weight selection of our top adjustable dumbbells? We chose the best of the best with dials and with manual grip changes. You can find the top-rated choice for either one. Case: Is it important to you to be able to travel with your weights? Do you spend time on the road, and you need exercise equipment everywhere you go? We offer excellent selections below that come with carrying cases, too. Size: Whether your gym is your living room or a 6,000-square foot professional space, you need to know how much room will be taken up by the heaviest adjustable dumbbells. We provide the height, length, and width in inches for you. 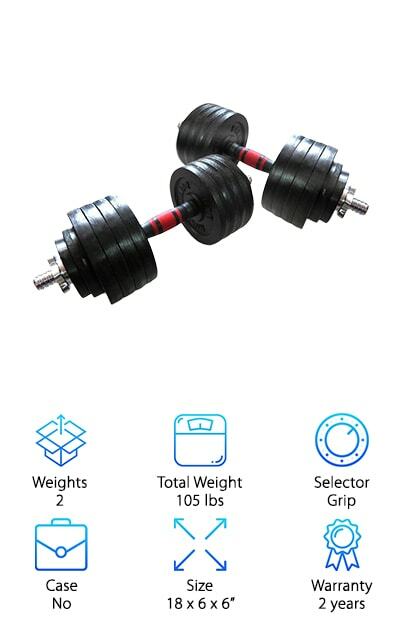 Warranty: If you’re worried about quality as you look at our adjustable dumbbells reviews, never fear. We took the time to mark down the warranty and money-back guarantees for each of our top ten items. You’ll know exactly what you’re getting! How would you like to be able to combine 15 separate sets of weights into one? Check out the Bowflex SelectTech Adjustable Dumbbells, our top pick. You will receive a set of two weights, in black and red, with stands included. Each dumbbell goes from 5 pounds to 52.5 pounds with the turn of a dial. That equals 105 pounds of lifting power, a great option for both men and women looking to gain strength and put on muscle. The dial allows you to go up in 2.5-pound increments, all the way up to 25 pounds. Those small adjustments mean you have even greater control over every exercise. The metal plates are encased in durable molding so you don’t have parts clanging around as you lift. 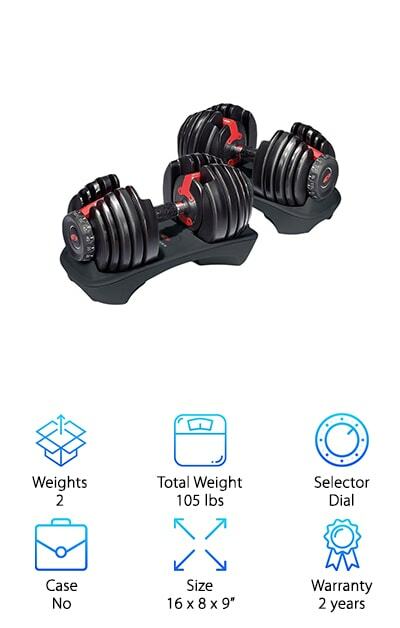 Even better: These adjustable dumbbells are compatible with the free Bowflex SelectTech app for both iOS and Android, so you have immediate help guiding your workout. You will also enjoy the 2-year included warranty! Our budget pick is affordable, but it does not skimp on quality. 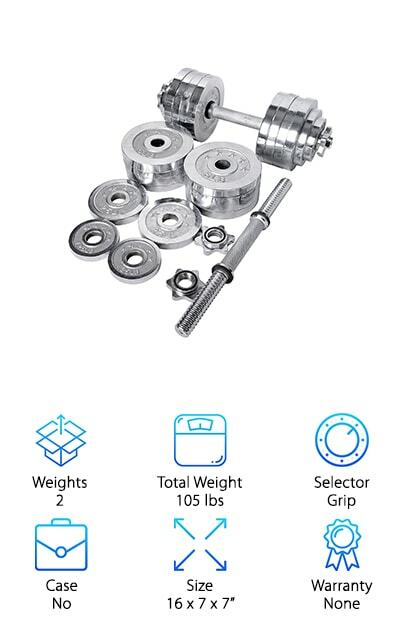 The Yes4All Adjustable Dumbbells really are suited for just about anyone, especially people who want to establish their own exercise space in their home or their garage. What are we talking about? You’ll get two handles, four 5-pound plates, four 3-pound plates, and 4 collars. That is a total of 40 pounds of weight that you can use to work out arms, legs, core, or wherever it's needed. The plates are rust-resistant, made of solid cast iron. The solid chrome handles have an ergonomic design for easy grip and maneuvering. The collars are star-shaped spin-lock equipped and are very easy to change out for a different weight. They will hold any of the plates without wobbling. Yes4All stands by their product, with a 60-day money-back guarantee, and a 5-year warranty on both the plates and the other parts. Start with lower weights, and work your way up! 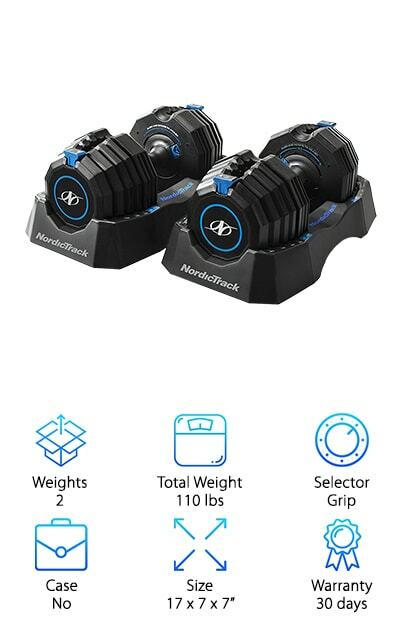 If you’ve ever resisted the idea of purchasing and owning your own dumbbells because they won’t be heavy enough or have enough range, Unipack is here to prove you wrong. 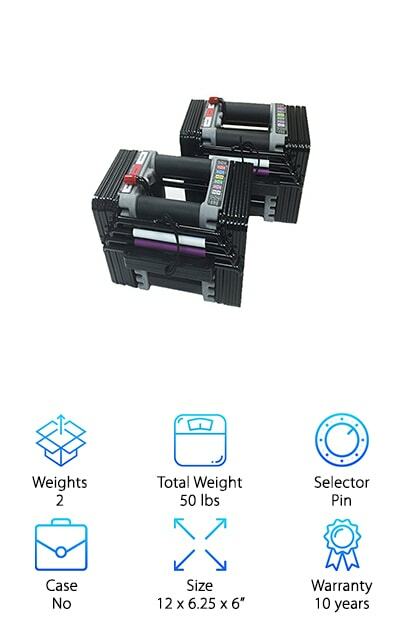 The Unipack Adjustable Dumbbells go up to an incredible 200 pounds in weight. And with 8 10-pound plates, two 5-pound plates, and two 2.5-pound plates, you can come up with dozens of combinations to work out everything from your triceps and biceps to your quads and hamstrings. The plates are all made of cast iron. These will last a very long time, whatever the environment. The handles are made from chrome, and both the handles and the collars are threaded to keep each plate secure. The collars will continue to hold the plates well, and at 16 inches long, the handles can easily support 100 pounds. The price for this set is fantastic, and you also get a 1-year warranty on your purchase. Expand your workout and get moving. A gym is a great resource for exercise and all sorts of equipment. But the truth is, you can now get the same workout at home without an expensive membership! It's all about setting up space where you have everything you need. The perfect place to start is with the right set of weights. That's why our reviewers love the Bayou Fitness Dumbbells. They are excellent value for your dollar. You don't need multiples – you only need this pair and their handy storage trays. Each is an adjustable dumbbell that goes up to 25 pounds in 5-pound increments. That equals 50 pounds of lifting power. Tackle weighted lunges, squats, core work, lateral raises, tricep curls and other muscles with targeted moves. Let your dumbbells grow with you as you get stronger and stronger. This well-made set of supplies will keep you going as you improve. Best of all, they take up very little room and can be stored easily. There are innovators and leaders in the world of fitness, and Power Block is one of them. Here’s the scoop: They have been designing and perfecting gym equipment for 25 years now, and one of their best-selling items is the PowerBlock Elite Dumbbell. 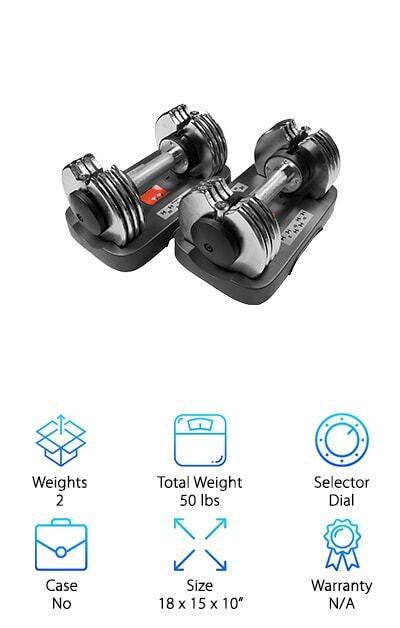 This is a set of two Elite Dumbbells, each carrying up to 25 pounds in weight, in adjustable 2.5-pound increments. Those are some of the smallest increment changes available on our top ten list. It equals 50 pounds of workout fuel. The other thing that’s so great about PowerBlock weights is their incredibly innovative design. They are not round, they are square. They stack easily into each other and separate with the move of a pin. That means they take up almost no room at all, and are extremely simple to use during your exercise routine. If you want to expand your set, you can buy the add-on kit to bring the weight range up to 70 pounds. The Ringstar Dumbbells not only work well, they look awesome too. These are gym quality cast iron plates, but Ringstar takes it one step further. The plates are then spray painted chrome silver for a professional look and feel. You will receive a set of two handles with plates equally 105 pounds total, or 52.5 pounds per dumbbell. Each can be adjusted in 5-pound increments. In addition to the handles, you get 4 collars, 16 5-pound plates, 4 2.5-pound plates and 4 1.25-pound plates. Tighten them firmly with the collar, and they won’t move around, they will stay put as you lift. The chrome also stays in place, with a chip-resistant design. Everything is made to be set up by hand, including initial use. There are no tools required. This weight set and its many combinations are perfect for a varied workout, that utilizes your entire body. Leave the excuses behind, and step up your game with the Ringstar Dumbbells. Do you want to increase resistance, grow muscle and gain dividends from your workout like never before? It won’t happen unless you are putting in both the time and the research. Luckily, our reviewers completed the research part for you! 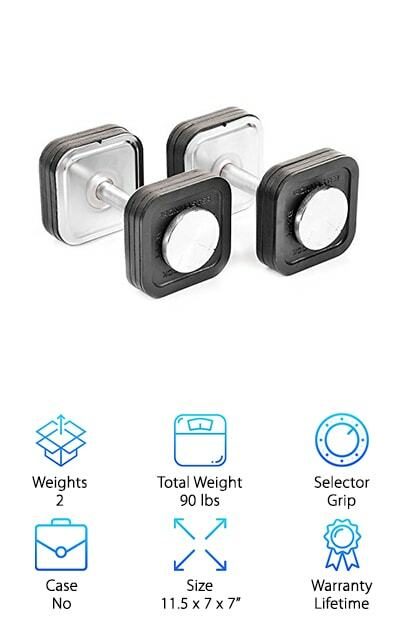 They found an awesome set of weights at a wonderfully low price point: The Giantex Adjustable Dumbbells. Not only are these a tremendous economic value, they will help you get stronger in a very big way. Check this out: You will receive two handles, made out of steel. There are four collars to screw in the weights tightly. Then there are the plates: 8 5.5-pound plates, 4 2.75-pound plates, and 4 1.65-pound plates. Each plate is made from a propene polymer, and then they are filled with sand to hit the correct weight. Put on your gloves, queue up your workout and get moving. Enhance your rows, your raises, your lifts, and your twists. It's a great set for beginners! Are you looking for a set of dumbbells that will last you a lifetime? The gym isn’t the only place you can find them. You can get a set that fits right into a corner of your own home, and doesn’t take up a lot of room! It’s time to invest in quality, and that means you need to look at Ironmaster Adjustable Dumbbells. These are the real deal. Their heavy-duty construction means you get a complete set of dumbbells with no rattling or wobbling. You can maneuver them safely and quickly, and weight changes are a breeze. Each of the two dumbbells goes from 5 to 45 pounds, which means you have 90 pounds of exercise potential. Ironmaster has their own quick lock patented design for changing weight selections. Worried these won’t stand up to hard work? Go ahead and drop them. They are made without plastic or breakable parts. Of course, we have to mention the lifetime warranty, too! 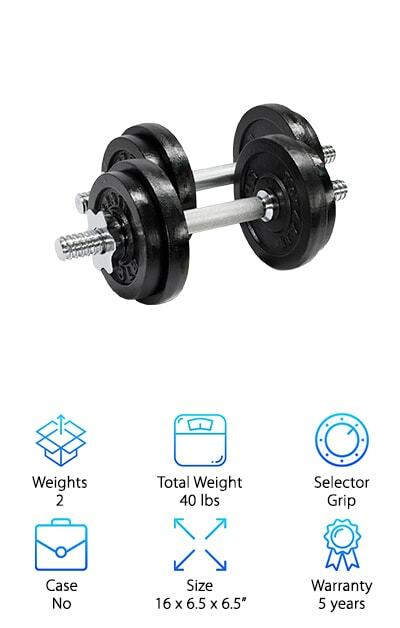 You can make one purchase and end up with 30 sets of weights. NordicTrack Speed Weights are the way to go! They are going to be the envy of every friend who shells out money for a gym membership each month, while you get the same results at home. These are the same high-quality metal you will find in a professional setting, coated with heavy-duty plastic. Each dumbbell lies in its own handy tray, which also makes storage very simple. Use the patented switching system to choose any weight between 10 and 55 pounds. Then get to work! Strength training with NordicTrack can open the door to weight loss, fat loss, and toning and definition of your muscle groups. It can benefit everyone, from working moms to older sedentary folks who want to be a little more active. You can even improve your bone health! There are a million reasons to get your workout on and give NordicTrack a try. If you are considering purchasing exercise equipment for a home gym, there are a few things to consider. Cost, ease of use and long-lasting construction are usually the big three. Our reviewers found a product for you that checks every one of those boxes. 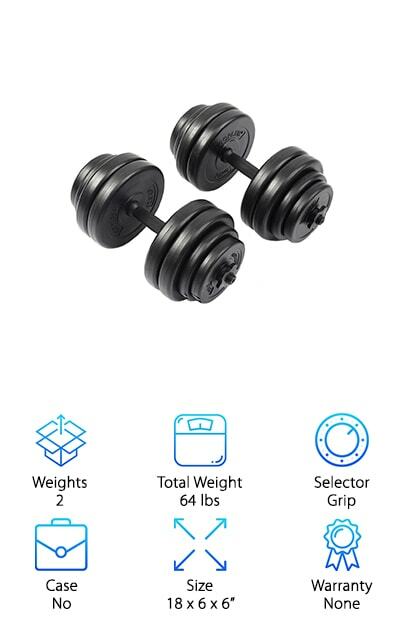 BalanceFrom Dumbbells are an affordable purchase, with durability that compares to products sold at three or four times the price. This is a set of two dumbbells, each going up to 52.5 pounds. That is 105 pounds of training, conditioning and flexing potential. Here's a closer look: Each dumbbell is made of solid cast iron. The plates are rust and oil proof thanks to a baked enamel finish. The handles are textured and contoured so they don't fall out of your hands as you lift. The bars are longer than most on the market, so there is ample space to tighten grip with the collars, even with every plate on the bar. Go burn some calories!